Experience and explore backwaters of Hillsborough and Tampa Bay! Always a short distant and boat ride to great fishing in Tampa Bay Inlet. Enjoy fishing one of the most popular cities in Florida, it has a unique ecosystem found right within downtown. 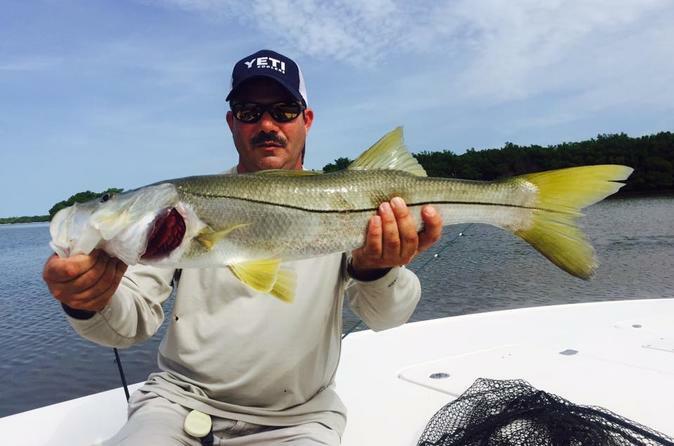 Fishing is great all year round, and there is such diversity of nearshore, flats and backcountry fishing for Tarpon, Snook, Redfish, Trout, Snapper, Sheepshead, Cobia, Drum, Pompano, Spanish Mackerel, Bonito or Sharks, depending on the season. Even on windy days there are plenty of places to fish, in the Bay you can fish one of the many barrier islands, and hundreds of miles of backcountry water shoreline, making this an experience, not just another fishing trip. The Captain provides fishing instructions and casting lessons which are all included for beginners and advanced techniques for the experts. Tours are suited for both first-timers, experienced anglers, elderly, youth, families and children of all ages and are handicap friendly. So everyone is sure to have a blast as you fish with ease and comfort of the calm backwater never worrying about being seasick. Fish comfortably in our 20+’ boats, accommodates max of 4 people plus the captain, and are equipped with GPS and livewells to keep your catch. While out on the water, the boat will have a cooler on board with ice and bottled water to keep you hydrated. There's plenty of space to bring lunch sandwiches or your additional favorite beverage. Alcohol beverages in cans are permitted. Never concern your selves of the worry of restrooms, as there are few along our path. The trip always includes the use of rods, reels and tackle, bait, lures, and fishing licenses. Legal catch will also be cleaned and packaged for you at the end of the day. Book with confidence on TripAdvisor it's secure and easy! Please note: All charters are subject to weather. In the case of unfavorable weather you will be provided the option to reschedule or full refund.